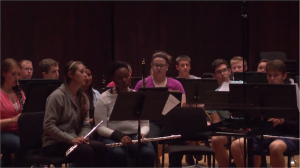 This video clip shows portions of the very first collaborative rehearsal with the Autumn 2014 Symphonic Band on this composition. Posted by Scott Jones at 6:00pm March 22, 2016 Posted in 2. Eagle Squadron by Kenneth Alford and tagged 2. Eagle Squadron by Kenneth Alford. Bookmark the permalink.